Welcome to Day 4 of The Ten Days of Reading Aloud! It is also READ ALOUD THURSDAY. I've been joining RAT for the past couple of years at my friend Amy's blog, Hope is the Word. Amy possesses a wealth of knowledge about reading aloud. Each Thursday people write about what they are reading aloud and link with Amy. Today I'd like for YOU to share what you are reading aloud this week. On day one of this series I challenged you to read aloud to your children, remember? The read alouds I'd like to share today are all inspired by a recent trip we took to Colorado and Wyoming. When I knew for sure we would be going I started RESEARCHING. I always look for read alouds FIRST when trying to teach my children about any topic. A good book story draws the children in and gets them excited about a topic: it's an immersion in another world, really. In one day we made a great "Oregon Trail Tour"... We drove first an hour and half northeast of Cheyenne to Guernsey, WY. Here you can see the deep ruts in the rocks that the wagons from travelers created. It gave me chills to stand in those ruts. Just a five minute drive from the ruts is Register Cliff, a large rock where travelers came and carved their names into the rocks. We saw many signatures from the 1800s, but we were a little sad to see lots of signatures from the 2000s, too....it almost felt like this historic place should be a bit more well protected. I got a few good shots of authentic signatures - this one is from an entire family. Often the signatures were to just record their names for posterity, but other times they were to let family and friends coming behind them know they had made it ok. I love this picture of Grant sitting by Register Cliff - I was trying to imagine a little boy his age in this very spot 250 years ago traveling to the Oregon Territory with his family. After our stop in Guernsey we drove another 30 minutes to Fort Laramie. The kids earned their Junior Ranger badges and experienced what life was like on a frontier fort. The following are the books we used to prepare for our trip. We also learned a lot about buffalo (bison) and the Transcontinental Railroad, but I'll save those read alouds for another post. Bound for Oregon, by Jean Van Leeuwen - This was a great read aloud for both of my children together. It is based on a true story of a nine year old girl who is bound for Oregon. One Step At a Time, by Howard Gutner - This is an early chapter reader. I read it aloud to just my seven year old. It takes place along the North Platte River, which we saw on our trip. It's a touching story about a dog -- stories about animals are some of our favorite read alouds. Life on the Oregon Trail, by Sally Senzell Isaacs - This book is a great book for INFORMATION... in fact, we found that there is also a free lapbook to go with it, and my son has been working on the pieces. I can't tell you how many times we said, "Remember when we read about that?". My poor husband; since he usually misses most of our read alouds I think he felt a little left out! If you do have a blog, please grab Amy's Read Aloud Thursday button or text link back to this post. 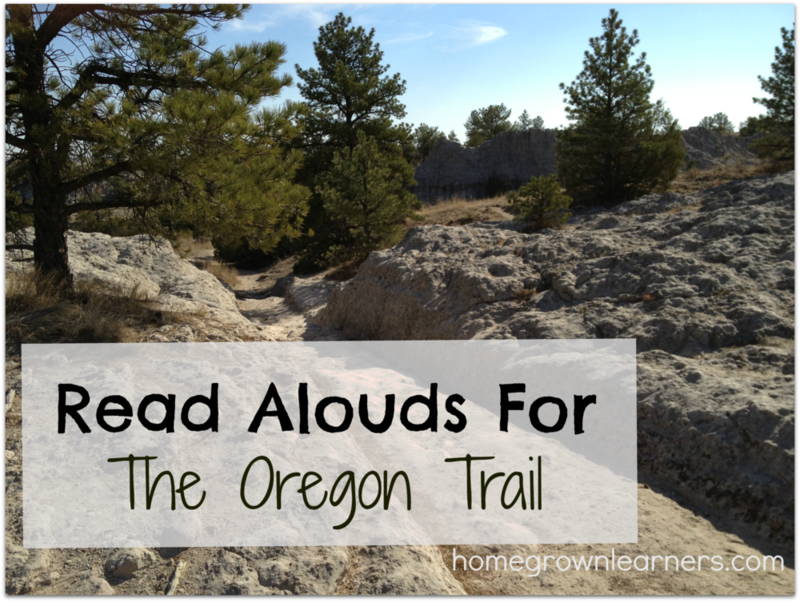 While you're at it, why don't you visit Amy and check out all of her read aloud suggestions!